Mohanraj Gurubatham is an Engineering graduate and currently running a Technology consulting firm. He also has got a post graduation in Master of Business Administration specialized in Retail Sales. Basically he is a Java and Android enthusiast and he is very much interested in using java whether it be a core java or using frameworks like spring. He has more than 18 years of practical experience in software development using Java/EE Technologies and worked as a technical architect for more than 9 years. The chown command changes the owner and owning group of files. If you are on Windows OS, before we get into the details of this command, I would suggest you to have a Linux machine for better understanding of the usage of this command. Not necessarily you need to physically have a separate machine. You can very much have a virtual Linux machine on a virtual box like Oracle VirtualBox. 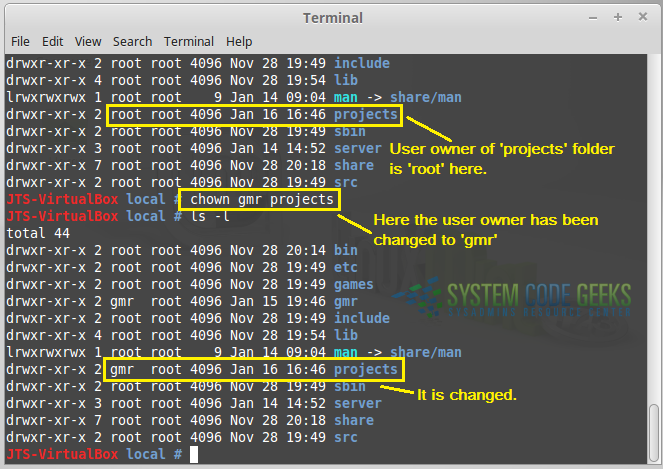 chown changes the user and/or group ownership of each given file. If only an owner is given, that user is made the owner of each given file, and the files’ group is not changed. If the owner is followed by a colon and a group name, with no spaces between them, the group ownership of the files is changed as well. If a colon but no group name follows the user name, that user is made the owner of the files and the group of the files is changed to that user’s login group. If the colon and group are given, but the owner is omitted, only the group of the files is changed; in this case, chown performs the same function as chgrp. If only a colon is given, or if the entire operand is empty, neither the owner nor the group is changed. -c, –changes like verbose but report only when a change is made. -f, –silent, –quiet suppress most error messages. -v, –verbose output a diagnostic for every file processed. –dereference affect the referenced file of each symbolic link rather than the symbolic link itself. This is the default. -h, –no-dereference affect symbolic links instead of any referenced file. This is useful only on systems that can change the ownership of a symlink. –from=CURRENT_OWNER:CURRENT_GROUP change the owner and/or group of each file only if its current owner and/or group match those specified here. Either may be omitted, in which case a match is not required for the omitted attribute. -R, –recursive operate on files and directories recursively. -H if a command line argument is a symbolic link to a directory, traverse it. -P do not traverse any symbolic links. This is the default. –help display this help and exit. Owner is unchanged if unspecified. Group is unchanged if unspecified, or changed to the login group if implied by a ‘:‘ following a symbolic OWNER. OWNER and GROUP may be numeric as well as symbolic. Please refer to the image shown below. We will see the details of the information given above with yellow rectangle mark. 1st Character – File Type: First character specifies the type of the file.In the picture above the ‘d’ in the 1st character indicates that this is a directory. Following are the possible file type options in the 1st character of the ls -l output. Field 1 – File Permissions:The remaining 9 characters, in order, refer to the read/write/execute(rwx) permission for the user owner, the read/write/execute(rwx) permission for the group owner, and then the read/write/execute(rwx) permission for everyone else.In this example, rwxr-xr-x indicates read-write-execute permission for user, read-execute permission for group, and read-execute permission for others. Field 2 – Number of links: Second field specifies the number of links for that file. In this example, 2 indicates 2 links to this file. Field 3 – Owner: Third field specifies owner of the file. 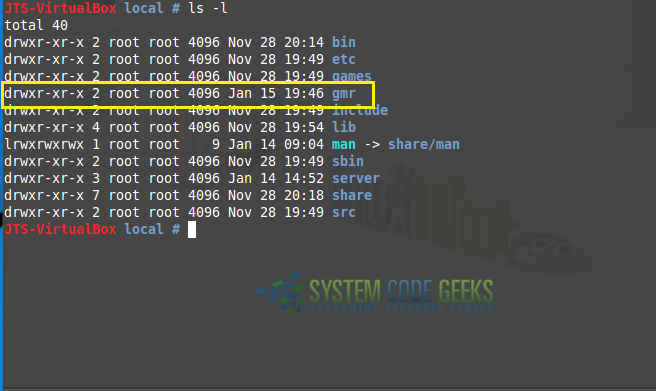 In this example, this file is owned by username ‘root’. Field 4 – Group: Fourth field specifies the group of the file. In this example, this file belongs to ”root’ group. Field 5 – Size: Fifth field specifies the size of file. In this example, ‘4096’ indicates the file size. Field 6 – Last modified date & time: Sixth field specifies the date and time of the last modification of the file. In this example, ‘Jan 15 19:46′ specifies the last modification time of the file. Please refer the image shown below. In this the user owner of a folder has been changed to a new user. But, user owner has been changed only for the directory ‘projects’. Ownership of the inner files or directories will remain the same, unchanged. If the flag ‘-R’ is used, it will change the owner for inner files / directories also. Recursively grant ownership of the directory projects, and all files and sub-directories, to user gmr. This can be done using the ‘–reference’ flag. 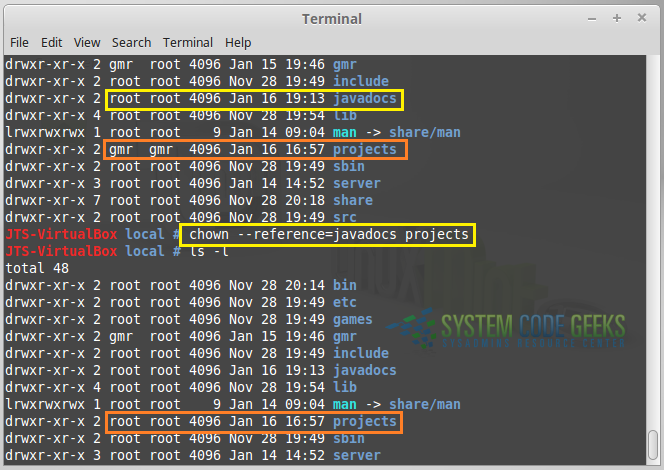 As shown below, ownership of ‘javadocs’ folder has been copied to ‘projects’ folder. 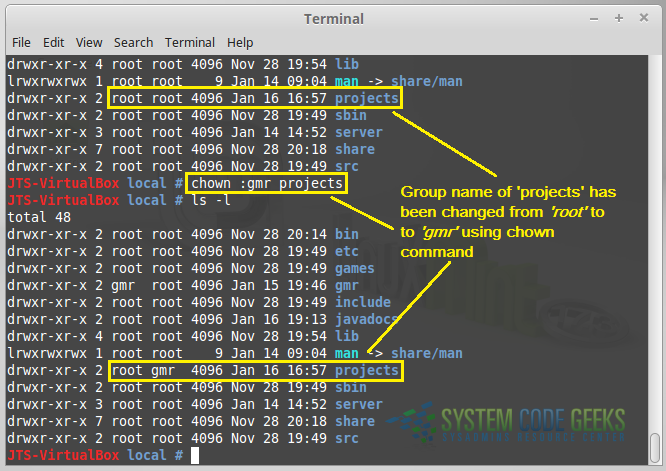 Using chown command, the group (that a file belongs to) can also be changed. In this Linux chown Example, we have seen how to use Linux command chown with different options.